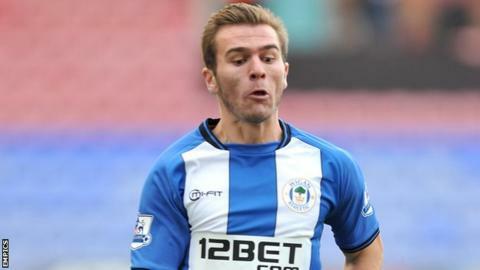 Wigan Athletic forward Callum McManaman has agreed a new three-year contract. The 21-year-old has played 25 times for the Premier League club, although all of his eight senior starts for the Latics have come in cup competitions. He began both FA Cup third-round games against Bournemouth and is likely to be involved again when Wigan face non-league Macclesfield on Saturday. "It was an easy decision (to stay). I was just made up to get it completed," McManaman told the club website. "The club is very important to me. When Everton let me go earlier in my career, Wigan were the ones who gave me the opportunity and I owe it to the club to stay loyal. "It was the best thing that happened for my career. I've loved every minute of it so far and I'm still enjoying it now. "I want to keep improving, keep making appearances and maybe get more starts under my belt. Hopefully in time that will come, because I believe there is a lot more to come from me." last season, scoring twice in 14 games for the Seasiders. His decision to stay at the DW Stadium until 2016 came eight days after with the Latics.